First let me apologise for the lateness of the months newsletter. I usuallly like to send them to you at the begining of the month but this time I thought I would wait until after the Great Northern Papercafts Extravangza (GNPE) craft show that I went to at the begining of September. It was ... as always ... a fabulous show and I ... as always ... spent too much money. 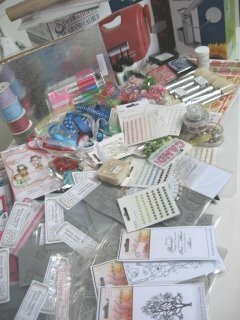 But there was such a lot of goodies there that I couldn't resist. One of the items on my wish list was some more of the fabulous Spellbinders and when I say "one of the items" that was an understatement. I actually bought eight new ones. The one I really wanted was the new Floral Flourishes and it is just beautiful. 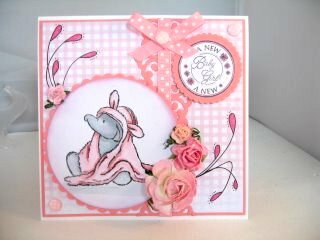 I have added it to lots of the cards I have made lately and I am so pleased with it. These are some of my other wish list items. From flowers, ribbons and pearls to lots of new stamps. The ones I particularly love at the moment are the new range from Lili of the Valley, especially the Christmas themed ones. They are adorable characters that colour up just beautifully. I was also pleased that with a magazine subscription I have there where 20 more pre-stamped images for FREE. And none of them duplicate the stamps that I had bought. So I have a lot of new LOTV images to work with over the next few months. Another adorable stamp is the Humphreys Corner collection from Crafters Companion. They are all about an elelphant and his family. His mum and dad, his sister and baby brother. And there is now a new Christmas range out. In the last newsletter I told you that I really coveted the Grand Calibur Die cutting machine. I had so many emails telling me what a wonderful machine it is that I went ahead and bought one. Thanks for all the advice that was given to me. It helped me to make a positive decision. I have used it along with the new dies and I am very pleased with the results.... But do you know they are bringing out a new one this month too. Can't wait to see this one. Over the last week I have made four new videos and they will all be on the website by the middle of this week. Two can already be seen and both have already had comments about them on YouTube. is something you may do already whenever you are sitting with a pen in your hand, but it may not be something you have thought of adding to your cards. I have added it to the pictured card and it just makes it that little bit different. It can be as simple or as intricate as you wish to make it but this is just a short video to help those who don't know how to doodle to get started. With a few illustrations of the effect on a plain card front. Basic Colouring is another of the new videos on the website and I am sure you will enjoy the simplicity of it. It shows you how to alter a simple plain image and make it look different. We all get bored with stamps that we have had for a while and this is one way to easily give them another look, with just a colouring pen. It works especially well on animal stamps and maybe you aren't confident yet that you can get a good effect if you try to colour in completely. Try this little method and see what you think ....it's fun and easy to do. 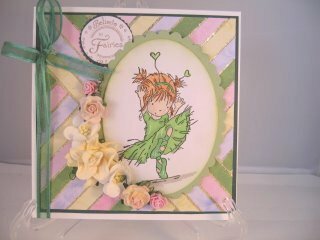 The Floral Flourishes have been added to this card... aren't they gorgeous??? This Mosaic Card was added at the begining of this month and is another easy idea with excellent results. 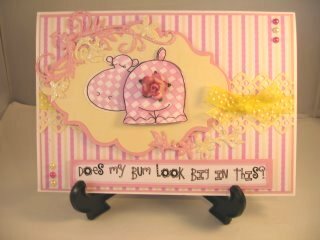 I have added both the Written Instructions and a Video Tutorial and I hope you enjoy making the card. And I hope you will add them to the Gallery pages if you do. Thank you to all of you who continue sending your additions to the Gallery Pages. I hope you have told your friends to see them on there and on Facebook. Facebook is updated on a daily basis and it will show all the cards that visitors send in as they come around. Please click the "Like" button if you visit FB for the first time. As always my thanks to those of you who have taken the time to send me your lovely emails.